QuickSilk Drag & Drop ease of use is consistently what our customers like most. This has several impacts on an organization A) Your simply more productive by a factor of 2-3 over WordPress and similar CMSs B) Its easy enough that non-IT staff will be able to update and maintain your website both reducing your costs and allowing you to be more responsive. And don’t think that this “ease of use” comes at the expense of functionality. You can build websites that are sophisticated, highly functional and “easy on the eyes”. Security is our passion at QuickSilk and nobody does it better, particularity at our price point. Beyond the normal benefits of a “Hack Free” life, security is becoming an important factor in SEO rankings. Google “Blacklists” sites that it identifies as unsecure and this definition is expanding every day. If you use Chrome you may have also noticed that they are “tagging” websites with icons to say “secure” or “unsecure” . Again this indicates a lack of security and directly affects your SEO ranking, not to mention what your customer think when visiting your site. 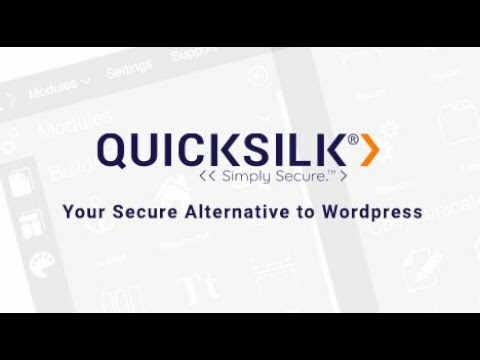 QuickSilk offers a fully managed, fully supported platform that addresses everything you need to manage a website: industry leading CMS platform, secure host, application of and testing of all website software updates, IT support, 24x7 monitoring of your website and personal product support via phone, email or InApp. There is no “finger pointing”, no additional charges, its all provided for a single fee. A brief demo of QuickSilk will allow you to quickly grasp the incredible value QuickSilk has to offer. During the demo we'll provide an overview of the platform and show you some basics like i) Editing content ii) Changing the structure of a page iii) Adding new content, pictures, video galleries iv) How to make a form quickly and easily v) How to add a blog. We will also demonstrate our extensive SEO capabilities and have plenty of time to answer your questions. After the excitement of the demo the next step is to take a FREE TRIAL. You can either work with the website you saw us demo or build your own website from scratch using one of our 70 templates. Once you get started you will quickly pickup and explore more than 70 Drag & Drop modules and understand the power of the global settings. This usually takes about 15 days and you will be convinced that QuickSilk is the right choice for your organization. If you commit to QuickSilk within 15 days from the demo QuickSilk has a FREE migration offer for you. We also include training and and ongoing success coaching to ensure that you get off on the “right foot” and that your decision to select QuickSilk is a success.